There are black teas (what many in the world call “red tea”), green teas, white teas, rarer yellow teas, purple teas, hundreds of oolong teas … and then there’s pu-erh. Strange. Mysterious. Off-putting. But, as with anything new to you, starting out is easy – just take that first step. Here is a pu-erh (or two) that can get you started. But first, a little about what pu-erh tea is. White Pu-erh – This is called “bud” and “silver tips” pu-erh and is made entirely from the highest quality uppermost tender buds of the tea plant gathered exclusively by hand in Spring. Green Pu-erh – This is called “raw,” “uncooked,” or “sheng” pu-erh. There is a young version that has not completely fermented and an aged version that has undergone a complete fermentation through dry storage, usually for 5 years or more. Black Pu-erh – This is the true “black tea” (aka “shou,” “ripe,” or “cooked” pu-erh) and dates from the 1970s. 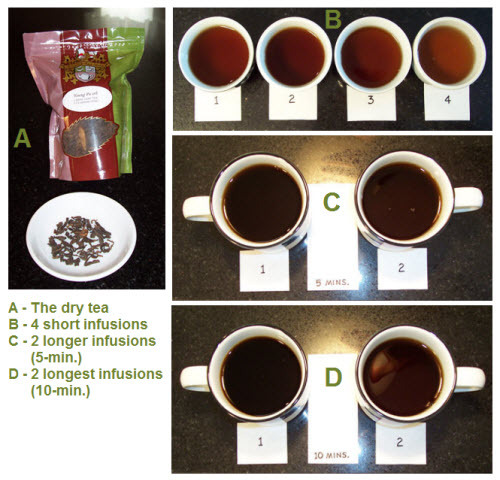 It is a way to mimic aged green pu-erh to meet market demand. The most important difference is Wo Dui (a Chinese fermentation process used for this style of tea) where temperatures are strictly controlled and humidity is kept high to break down the natural structure of young tea leaves to remove bitterness and unwanted flavors. Still with me? Good. At this point, I would say that which of these you start out with would depend on your overall tea preferences. If you drink mostly regular green tea, then go for a green pu-erh with a few years of aging to remove some of the bitterness, for example. However, being of a more…uh, well, not really pushy…more like “helpful” nature, I can’t resist passing along the recommendations below. My first recommendation is that you start with a loose version of pu-erh, not the kind pressed into cakes (beengs), bricks, or mini cakes (“tuochas”). Otherwise you might quickly get frustrated by trying to chop some off to put in your steeping vessel (often a gaiwan or Yixing teapot – see more info on these in my articles: part 1, part 2, and part 3). The other benefit is that you get to play around with blending the loose tea with other loose teas you may have on hand. Keemun and Assam are a couple of black teas to try blending with the pu-erh. It will reduce what some find to be the unpleasant side of pu-erh – what they call that “dirt” taste. One to try: Golden Pu-erh Loose Leaf Tea is aged for 5 years deep in the mountain caves of Yunnan, China. The flavor has musty, elemental notes. The leaves have a wonderful aroma that is earthy yet sweet, very nice. The instructions say to steep 2-10 minutes in water that has been brought to a rolling boil. I recommend starting with 2 minutes, adding 30 seconds for each subsequent infusion of the tea leaves (you can infuse the leaves several times). The first infusion will be fairly light, with the following infusions being darker, a bit earthy, and yet caramelly without bitterness. If you’re really adventurous, you might try my own recipe for a chocolaty version of this tea: Tea Experiment — “Mocha” Pu-erh. There is also a version of this tea with caramel added to enhance the natural caramelly flavor. See my review.